This page describes the two plays we currently perform (Colder Than Here and Home Death) and the play we hope to commission (The Choice). If you wish to enquire about booking our theatre productions, to stimulate discussion or support bereavement training, please contact Judith. The purpose of this project is to promote dialogue to help release some of the taboo, fear, denial and guilt about death and dying, and to bring awareness of the choices available; to offer a means of dialogue in a place of safety; and to answer educational needs where appropriate. We also offer pre-production play-reading workshops; and where necessary a psychotherapist or counsellor is available for support. Through the generosity of 'Taboo Theatre Company', created especially for this project, we have been performing the play since 2008. Not only have we taken it to the larger public but also to the closed communities of hospice and prison as part of an education programme, to the International Arts Conference in Venice 2009 and to Durham University as part of the 2009 International Death, Dying and Disposal Conference. The play deals with a mother dying of cancer and how she helps her dysfunctional family to cope with their forthcoming loss and separation by the choices and responsibility she takes - which include looking for a green burial. Stereotypical male, Alec, unable to interact on an emotional level, turns to fixing the heating as his way of dealing with this difficult situation. The sisters, with a history of jealousies and spats, are very different from each other. One, a tearaway, causing endless difficulties at home, the other apparently less selfish and more capable, begin to change. Gradually we see the family mature and become closer and it is this journey towards death which is so engaging and thought-provoking. In this poignant and often mordantly humorous play, we move through varying emotions: "...and she's sat in the coffin, middle of the living room floor and she's - she's watching Have I Got News For You and she's laughing, sitting in it, laughing". "Alec. It doesn't go away if we don't... [talk about it]". 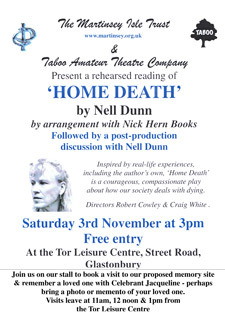 We have performed rehearsed readings of this play in many locations over the past few years. The play was inspired by real life stories. It is courageous and compassionate and sensitively raises issues about how society deals with death, dying and palliative care in the UK. Home Death encourages open discussion and thinking about choices around death and dying. In May 2012, this production was first performed for The Martinsey Isle Trust by 'Taboo Theatre Company' as a rehearsed reading. It formed part of a 'life-affirming' death awareness initiative highlighting local resources to help with end-of-life concerns, funerals, green burial choices and bereavement care. Each performance includes a post-production discussion with the cast and the Trust on the issues raised by the play. 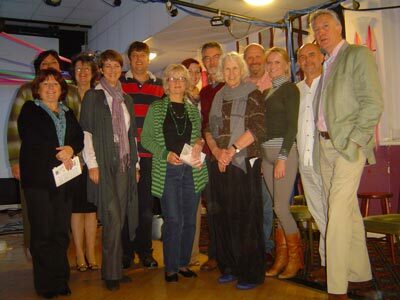 Our November 2012 performance was in Glastonbury, and we were delighted that the play's author, Nell Dunn, joined us for the post-production discussion. As one of the characters in the play says: "I didn't know what dying looked like. I didn’t know what to do. I didn’t know how to help him." The Martinsey Isle Trust and Dr Jan Hatanaka are working together to raise funds for a play to be written by Mick Gordon focusing on bereavement based upon Jan's case histories. Jan's approach to grief and reconciliation is informed by her personal experience; her extensive academic research on the universality of grief and loss; and her in-depth discussions with hundreds of individuals willing to recount their personal stories. The founder of Grief Reconciliation International Inc., she holds positions at York University, Toronto, in the Department of Nursing, the Religious Studies program, and the York Institute for Health Research. She has a B.Sc. in nursing from the University of Ottawa, an M.A. in education and counselling psychology from the University of Toronto, and a Ph.D. in theology from the University of Wales. Mick says: "No aspect of living a good life can be more important to us than our relationship to death. This is a shocking and beautiful understanding. Our play will be an inspiration for those attempting to live the good life. A gentle and careful emotional journey following one of Jan Hatanaka's amazing characters on his search to find the reason for his strange behaviour. A profound detective story, taking him into his past and into a re-connection with his family, revealing the source of his disquiet and offering him the potential for future contentment. Judith [Pidgeon] will acquire the rights for me to write to her commission – a truly exciting project."